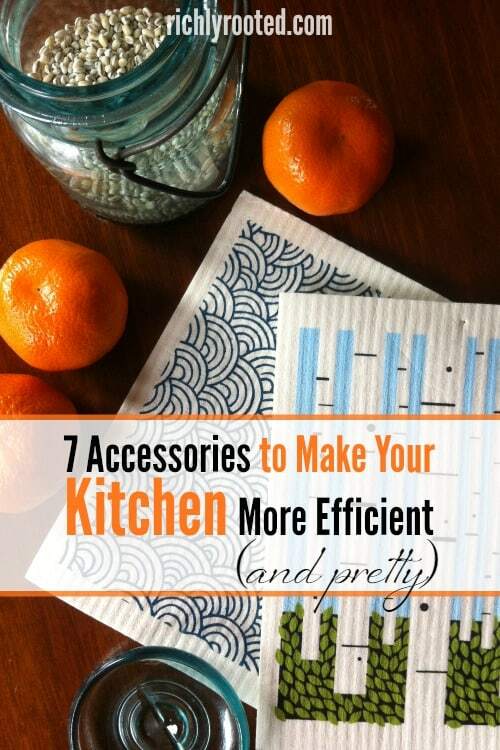 Accessorize your kitchen! These 7 kitchen accessories will simplify your life AND give your kitchen a touch of personality and coziness! 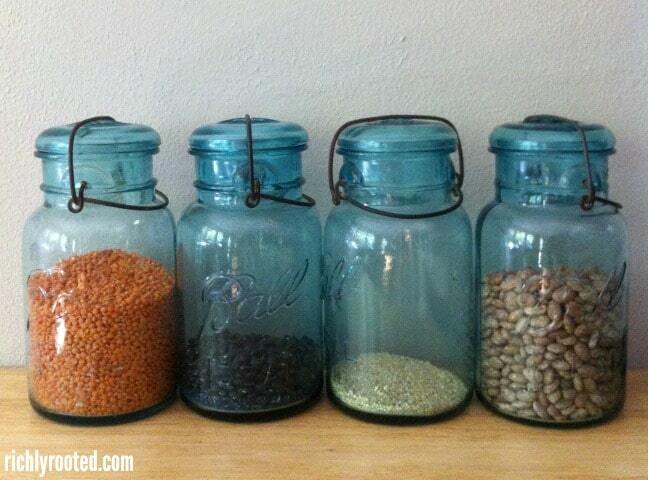 Want to breathe new life into your kitchen–without spending much money? Just like you can wake up a mundane outfit with a few well-chosen accessories, your kitchen can benefit from quick, frugal additions. Over my six years of marriage I’ve collected a few favourite kitchen accessories that not only simplify my life, but give my kitchen a touch of personality and coziness. When we lived in a series of apartments these items helped to make each new kitchen feel like home. They’re a small but worthwhile investment when you don’t have the time or budget for new paint or appliance upgrades! 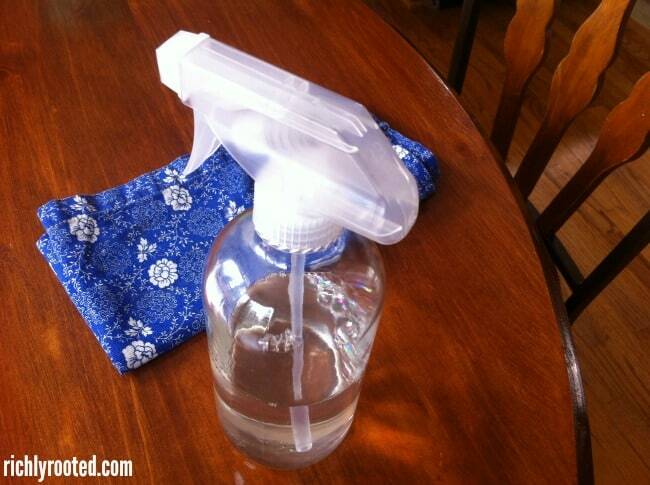 If you’re looking for ways to cut back on plastic, a glass spray bottle is a small investment that gets a lot of mileage. I got mine from Grove Collaborative. Not only is it beautiful, but it also doesn’t hang on to smells the way that a plastic bottle does. I can scent my homemade all-purpose cleaner with lemon one month and peppermint the next, and because the bottle is glass it won’t absorb or mix the odors from one batch to another. 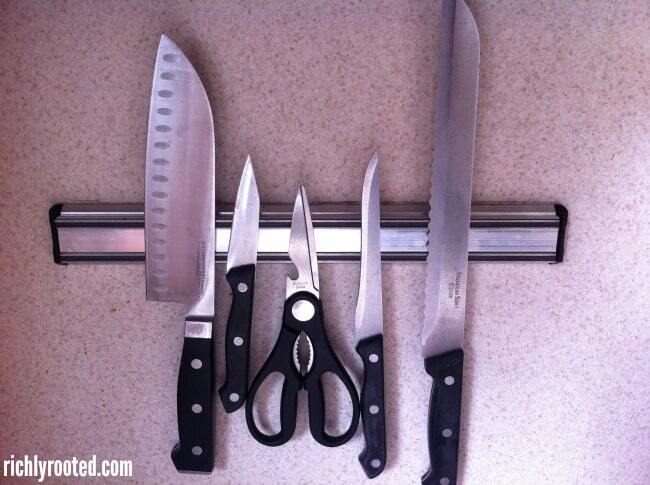 This slim, magnetic knife strip frees up counter and drawer space. I think it adds visual interest, too! My knives and scissors are easy to access, and the size of the knife strip sets a helpful limit on how many knives I keep. I’ve had a lifelong reversion to kitchen sponges because they get smelly so quickly. I wanted to find an effective (and pretty) alternative, and I finally have! Swedish dishcloths are my solution, and not only have they replaced kitchen sponges, but most of my paper towel usage, too! They’re made of natural materials and are super absorbent–they clean up food and drink spills like a charm, and don’t leave streaks on my glass cook top. Plus, they’re pretty and cheery! My friends at MightyNest are currently offering a special where you get 2 Swedish dishcloths for just $1 when you join their MightyFix subscription program! 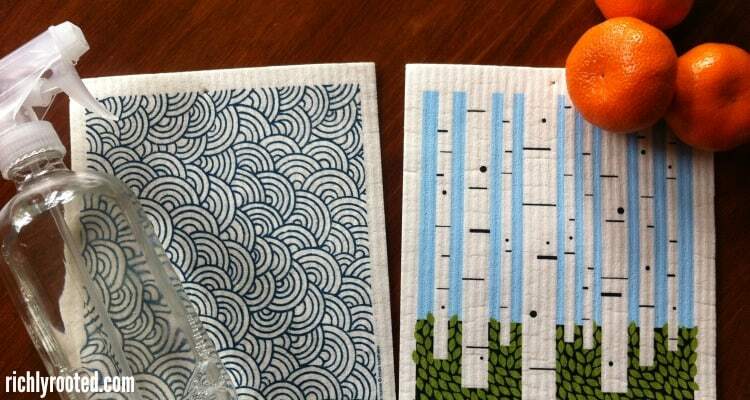 Read my full review of Swedish dishcloths in this post, plus get the details on the MightyFix! 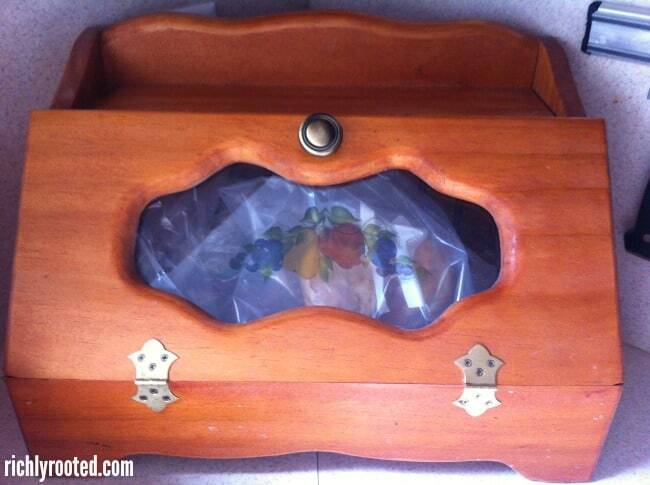 A bread box certainly isn’t a must-have kitchen item, but I gladly admit that I love mine! I found a nice, roomy wooden one at the thrift store. It fits a large loaf of bread, but there’s also room to corral tortillas, biscuits, and other baked odds and ends. Previously I stored these items on top of the fridge, but because they were out of sight I’d occasionally forget about them and something would mold before we had time to eat it. 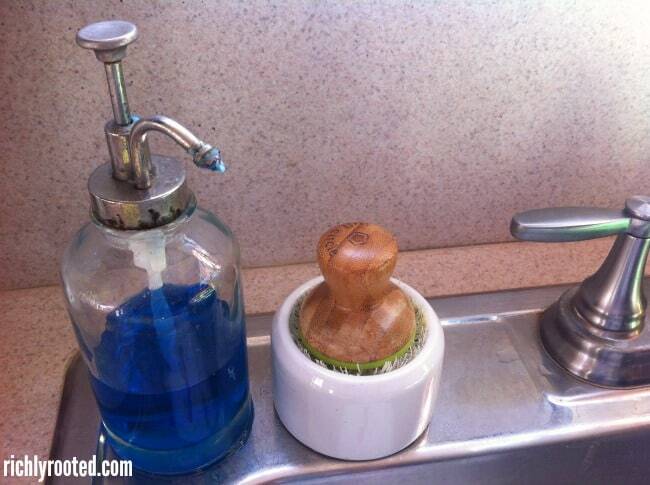 I’ve washed dishes a lot of ways, and this is hands down my favourite way to get them clean! (Other than sliding them in the dishwasher, of course!) For hand washing, this little set from Full Circle is the best. The spring platform inside the dish creates plenty of suds and helps your soap go a longer way. The scrub brush is effective and doesn’t scratch any of my pans. Also, I love how this looks next to my sink! You can find these at antique stores in various sizes. I started asking for them for my birthday several years ago, and now I have five that I use to store beans, grits, lentils, and other dry grains and legumes. A traditional tea kettle adds a homey touch to any kitchen. The biggest downside, in my opinion, of electric tea kettles is that they take up precious counter space! I value clutter-free kitchen counters, so having a cheery tea kettle parked on my stove top is a double win. Note: If you want to invest in an heirloom-quality tea kettle, MightyNest carries a gorgeous copper tea kettle, as well as a stainless steel kettle! These are ones you would probably pass down to your children! What are your favourite kitchen accessories? How do you embrace both form and function in your kitchen? I signed up a few days ago, what are the odds of getting these in my first box? Amy, do you remember what link you clicked to order through? If it was via a MightyFix link on this page, then yes, you’ll get the dishcloths in your box! Would you be willing to tell us where you got the soap dispenser that is next to your scrub brush? I’ve been looking for one exactly like that! I love the old-fashioned vibe a breadbox gives! I got that soap dispenser from Target about 6 years ago, but they may still carry similar styles! Totally agree with you esp. 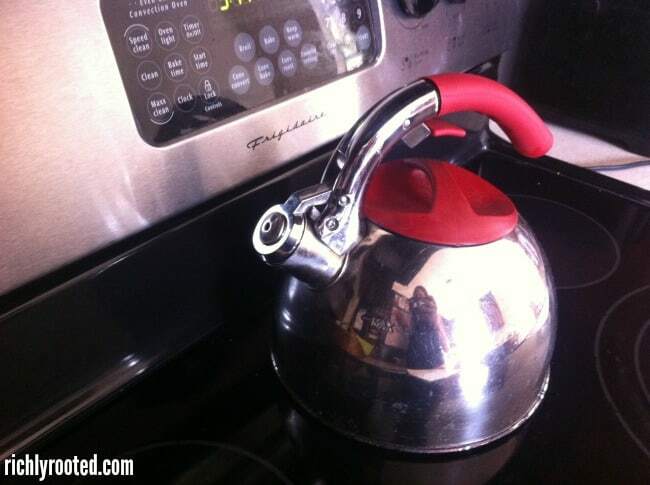 about the kettle: who needs another electric appliance on the counter? I. too. got my wooden bread box from a thrift store but I sanded off the door’s interior finish and swapped the knob to the inside. Why? I use the open door as a cutting board for my sandwiches, bagels, etc. and, because it lies flat on the countertop, I need the knob to lift it up and close it. I love that! My bread box door definitely does not lie flat…but if it did I would totally steal your idea! Do you know of anyone selling un decorated Swedish dishcloths, other than Ikea? Thanks! I’m sorry, I do not! Maybe they’ll become more widespread eventually and there will be more options! A bread box is important to me. Keeping bread and other baked goods on top of the refrigerator actually speeds up the aging process thereby making it mold faster. I wanted one dishcloth. But instead I was wrapped in a web and told how I would be SO wise to join something that I did not want to join. But I was NEVER simply shown a place where I could give my bank information in order to receive one Swedish dishcloth . Do you realize you wasted my time?. Are You going to send me a dishcloth? Are you going to disregard me as a cranky person? Am I going to go on a rant in facebook? No, I try not to disregard my blog readers as cranky people, especially when they have legitimate questions, as you do! (: Here is the listing to buy individual dishcloths, without a subscription to the service: https://mightynest.com/shop/green-cleaning/kitchen-bath/swedish-dishcloths. If you already signed up for the monthly subscription but want to cancel it, you need to log in to your MightyNest account and there will be an option to cancel. If this isn’t helpful or you have further questions, definitely send their customer service an email at [email protected]. You can also call them, Monday through Friday, at 847-905-0567.